There’s no mistaking a performance by the Moab Taiko Dan drumming group. With palpable energy they beat out formal percussion compositions on traditional Japanese-style drums, and it’s clear in their postures and smiles that they’re having fun. This month, the community is invited to join in the fun energy by participating in a number of upcoming drumming workshops. 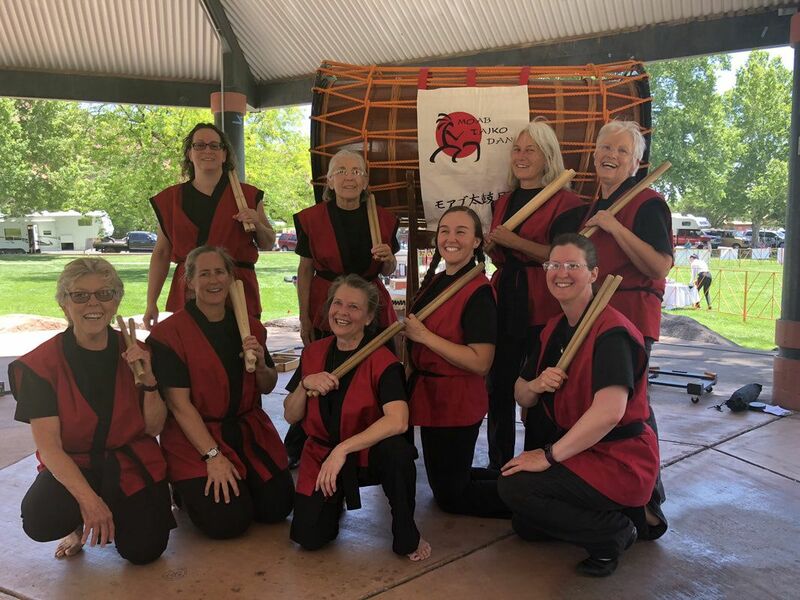 Moab Taiko Dan (MTD) was founded in 1994 and has been a crowd-pleaser at both public and private events over the years. The performers are invited to play at weddings, graduation ceremonies and festivals, and have delighted participants in Moab’s half marathon events by drumming along the course during races. The group’s sensei, or master, Tiffany Tamaribuchi, lives in Sacramento, California, and comes to Moab a few times a year to give instruction. Tamaribuchi is internationally recognized for her taiko mastery, and will be offering several workshops in Moab between Jan. 4 and Jan. 8, which are open to the public. Those entirely new to Japanese drumming will learn the basics, like how to hold the bachi, or drumsticks, and the proper striking techniques. Dahm said beginners “will learn how to relax their bodies into a posture that gives them power but doesn’t make them work harder than they need to — they will learn proper form. In the workshop, participants will get a chance to play three types of Japanese drums: shime daiko, which is like a snare drum, and chu-daiko and odaiko, the latter of which is a very large drum that can be played by two people at once. Most of MTD’s instruments were made by MTD members — some of the drums have individual names, like Oishi, which means ‘delicious’ in Japanese, and Bertha. Some of the drum makers engraved positive messages on the insides of their instruments before sealing them with the drum heads. Dahm emphasized that it doesn’t take a lot of upper body strength to perform Taiko, though it may appear that way to an audience watching the group. The drummers’ movements are sweeping and deliberate, and the resulting sounds ring loud. Dahm also assured newcomers that previous musical experience isn’t necessary, and that being part of Moab Taiko Dan is not expensive. The group provides drums to play and monthly membership is $20. The classes will take place at Grand County Middle School, which is also where Moab Taiko Dan holds its regular practices. Members are on the lookout for a new space to practice, whether that space is lent, donated, rented or sold to the group. When: Beginner class on Tuesday, Jan. 8, from 5:30-8 p.m.; Intermediate classes on Friday, Jan. 4, from 5:30-8pm; Saturday, Jan. 5, from 9:30-12 p.m. and 2-5 p.m.